The Master Chief Collection in Depth. Originally I had been all for buying the Playstation 4, but once Microsoft announced this, it’s kept me from changing. Are you as excited for the Halo 2 HD upgrade as I am!? This past E3, Microsoft announced that four games from their blockbuster Halo franchise would be getting collected as The Master Chief Collection. Here’s the first taste of how the anthology will look when it comes out this fall. Members of Microsoft’s 343 Industries team and dev studio Certain Affinity showed theMaster Chief Collection at this weekend’s Rooster Teeth Expo, explaining how the UI and various options were tweaked to create a unified experience. The panel opens with the impressive set-up that lets you jump from game to game, complete with the specific music for each one. 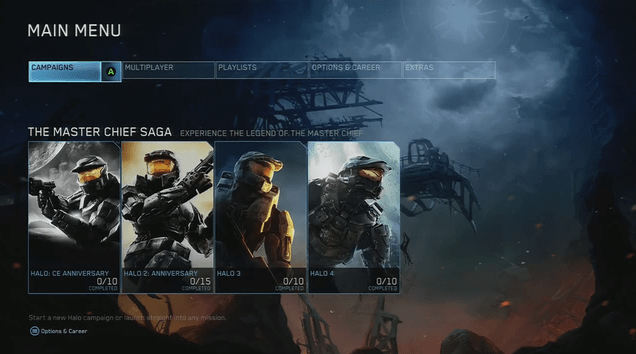 MCC will have preset playlists for multiplayer, as well online co-op for the Halo 2 campaign. The video from RTX is an hour long but features a in-depth look at the latest build of the game, which starts at about 24:30. In addition, for those who had been interested in glitching back in the day, it has been slightly confirmed that glitches such as the super bounce, and sword-canceling will stay, but only in the original versions of the maps for Halo 2. Though that being said, there have been rumors of the ability to bounce in the upgraded maps, but in different locations due to the geometry being revamped.